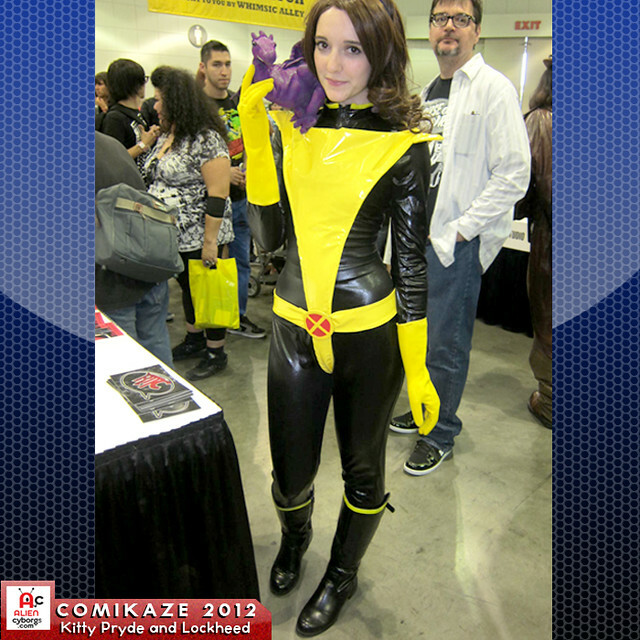 There was a lot of talk about this years Comikaze Expo at the Los Angeles Convention Center and the stories vary depending on who you speak to. If you listen to the stories about opening day there are bound to be a couple of common thread woven through out all the stories those common threads being: the heat and the lines! 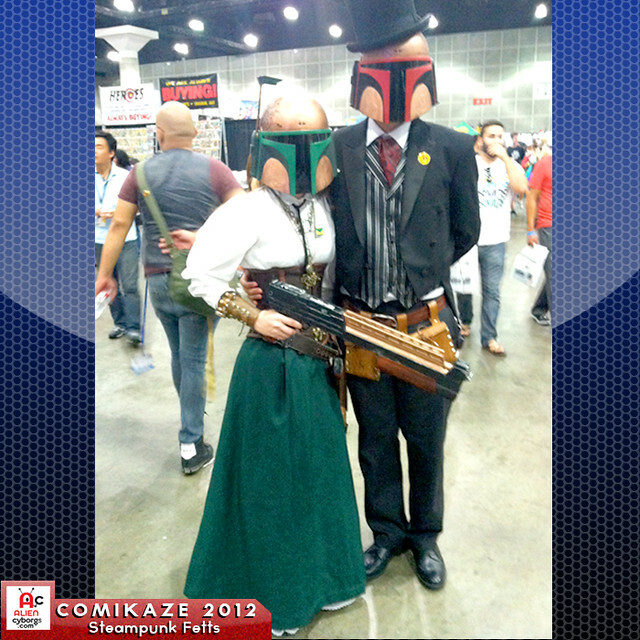 Let me first start off by saying that of the two variable that were in question, the heat and the lines, the staff at the Comikaze Expo could have done nothing to effect the heat…that was just plain out of their control. The second situation on the other hand could have been alleviated but lets leave that alone for a second. The convention just happened to fall on one of the hottest record breaking days of the year. As per the Los Angeles times “For the second straight day, temperatures downtown set a record high for the date, with Saturday’s 103 degrees beating 1979’s 102. The temperature may have gone even higher Saturday, but the thermometer at the downtown weather station stopped working at that 103”, weather officials said. stopped working at that 103, weather officials said. 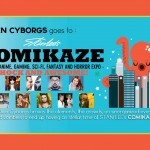 As we geared up to leave for Comikaze at 9:30 am and the temperatures were already beginning to soar skyward, it was almost 90 degrees when we left and by the time we arrived at Comikaze the temp had topped off at around 98 degrees and was steadily climbing. At 10 am there were already hundreds if not roughly around 1,000 people queued up in lines that snaked around the front and the side of the convention center looking like a trail left behind by a Tron Light Cycle! The Los Angeles heat on top of the long lines start people crumbling. MegaRam77, Pam Bunny and myself fell into the line rank and file with no complaints and since this wasn’t our first rodeo, we knew what to expect. With that said we didnt take into consideration how under staffed the event was due to such an alarmingly high attendance. 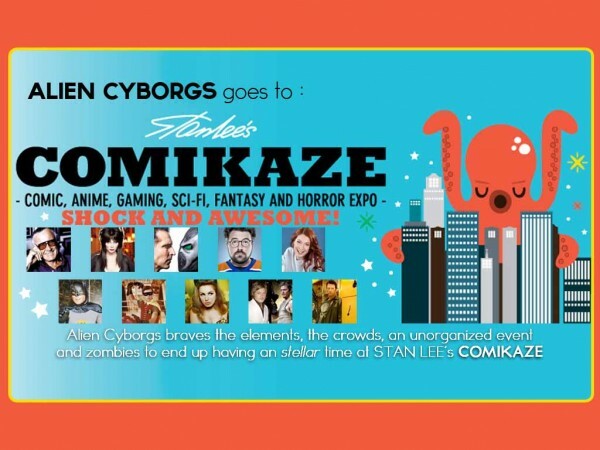 Last years Comikaze Expo on September 5th and 6th was 35,000 people, this year it was easily expected to double especially with Stan Lee attaching his name to the show! The line slowly inched forward and every now and again I caught faint grumblings of how disorganized the lines were and that some people were creating new lines and cutting into others. MegaRam and I sent the rest of our party to go sit in the shade as we stayed faithfully in line not giving an inch and giving the “stink eye” to anyone who looked as though they wanted to cut in line. We had started to hand out Alien Cyborgs pins and stickers to those around us and made “Line Friends” with those around us. 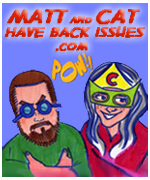 We started to chat with this couple who had a 11 months in a stroller dressed as Captain America and commented on how at least the poor lil guy wasn’t grumpy. It took us roughly about an hour to get within 20 feet of the sliding glass doors, we were close enough to feel the frosty blast of the industrial AC streaming out of the open doors…let me tell you it was a WELCOME feeling. 3 feet from the door I can see the security guards whispering into each others ears and pointing in our direction. “Whats this all about” I thought. Well, I was just about to find out! Just as the couple with the baby had crossed the threshold I got the “STOP RIGHT THERE” hand from one of the guards and just like that the other two guards slide the doors shut with a heart stopping SNAP! Our stroller pushing friends turned back to look at us and to the guards as if to say “Hey, they are with us!” but I gave them the slight head shake and gave them the old “NO, go on with out me….save yourself” look. I’m pretty sure the mother mouthed the words “Well, never forget you Jet.” but then again it could have been all the movies and the heat playing tricks on me. 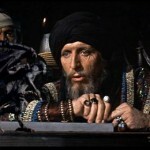 No, I don’t want to see your wiener! Looking back in retrospect the line moved along rather smoothly and there was more than enough eye candy to pass the time. There were also zombies on hand harassing the people in line and promoting the Zombie Apocalypse Maze that was a feature of this years convention. 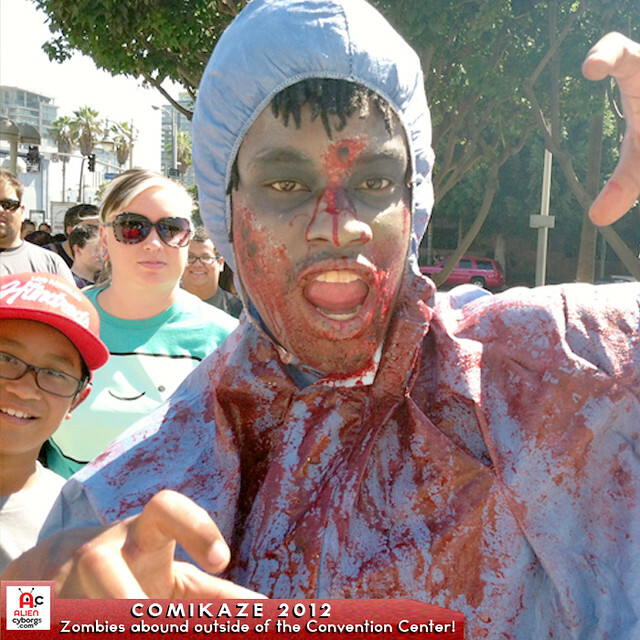 One zombie asked me if I wanted to see his weenie…why ME?! Anyway, the line itself was not as horrendous as some people were making it out to be, it was the mixture of the heat and the wait that made it unbearable. Admittedly this was not the well oiled machine that we all would have wanted it to be and there could have been a couple of things to make things move along a lot smoother. For one “Rope and Stanchions” creating a zig zagging line would have been a real big help to keep organized and people honest. They could have also had some sort of security presence outside to direct people where to go. Signs would have been a huge help by letting people know where to queue up. There were no lines marked so there was a confusion between those who purchased their tickets online, VIPs, Vendors, Talent and people who were trying to purchase their tickets that day. Now lets get back to our hero and the line getting cut off right in his face! The line had been cut off, the cold AC had been cut off and the security on the other side of the sliding glass doors were feigning like there was not a mob of people forming outside just two feet from them, which only made matters worse! MegaRam and I held our ground (and our place in line) and told those around us to remain in line, not to get worked up and to remain stay calm. Just then a poor young securtiy gaurd by the name of Reggie had the dangerous job of guarding the door and not allowing people in. His only script was “I’m sorry we cannot let anyone in until the crowd in the lobby thins out, once it does we will let people in.” Thats all we needed to hear…that put MegaRam and I in the “front” of the line when the doors opened. After about 20- 30 minutes of defending his post from VIPs, exhibitor, panelist and people trying to get in using every excuse from “I really have to pee” to “…my brother has my ticket in there.” There was this one unsuspecting dope who came outside to see what the big deal was and found himself on the wrong side of the glass…even HE couldnt get back in til the lobby cleared…and he was JUST in there! Finally Reggie opened the doors to us and I was greeted with a big blast of industrial strength Air Conditioning and the sights and sounds of Stan Lee’s Comikaze Expo. Elivra and Peaches Christ had a Horror Film Festival and the next day Elvira and Stan Lee along with 98.7 FM hosts a night with Peter Murphy at the Nokia Live. 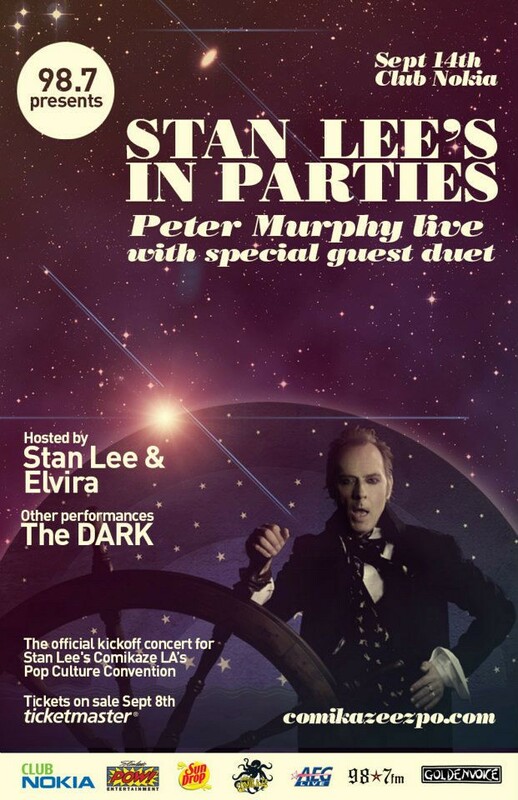 Bud Lite and 98.7 Present “Stan Lee’s In Parties” PETER MURPHY LIVE! 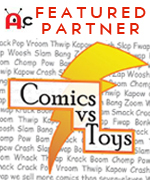 With Special Guest Duet, hosted by Stan Lee and Elvira. Other bands THE DARK. CLub NOKIA. Peaches Christ – Elvira and Peaches Christ’s Horror Hunt and envy of Drag Queens everywhere! Stan Lee and Todd McFarlane onstage talking about future projects and joking around. Meeting Todd McFarlane randomly and shaking his hand. Family Pictures with Stan Lee! 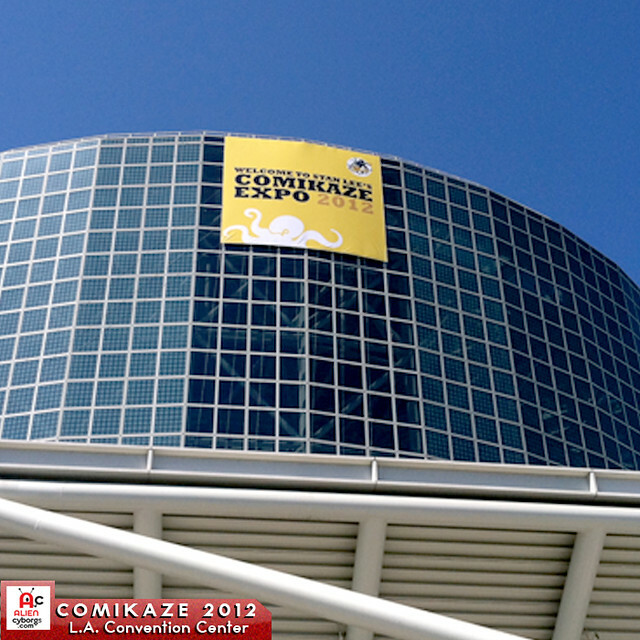 Check out the Offiicial Comikaze Expo Website to get an entire list of the Guests, Panelists and events here!